It's fixing something that ain't broke. Or it's a breath of fresh air off the Mediterranean. We drove a few hundred miles to decide. The 2017 Fiat 124 Spider is five inches longer than the 2016 Mazda MX-5 Miata. The best way to decide which roadster is better, of course, is to drive them. That’s why we asked a couple of longtime, passionate Miata owners to hop into the 2017 Fiat 124 Spider Lusso and tell us how it compared to their own beloved rides. They also drove the 2016 Mazda MX-5 Miata on which the 2017 Fiat 124 Spider is based, which we obtained via the Getaround car sharing service. Many miles later, these are their impressions. My Miata (an NB model, circa 1999) and I have been attached at the hip for more than a decade. I’ve driven the heck out of this little buggy and have had a blast in the process. The Miata body has undergone some Kardashian-level transformation over the years, but still, both it and the 2017 Fiat 124 Spider scream “sporty roadster.” I prefer the Fiat’s elongated front end and Euro flair to the 2016 MX-5 Miata’s squatter, more bulbous body. I also like the Fiat’s face—something about the sharp angles of the modern Miata’s headlights and the slope of the front end give it a menacing mug. 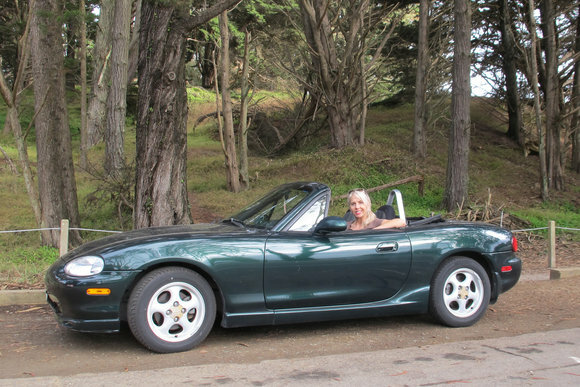 Katherine Stevenson loves everything about her 1999 NB Miata except the awkward mechanism for the droptop. In almost every regard the cockpits of the two modern roadsters are virtually identical, with the Fiat maybe a notch higher in quality. That’s particularly true of the Lusso model we tested, which features cushy leather seats—with seat heaters, natch. Other notable differences are the Fiat’s gearshift knob (square vs. round), additional padding on the doors, and a few added flashes of chrome—all matters of personal preference. 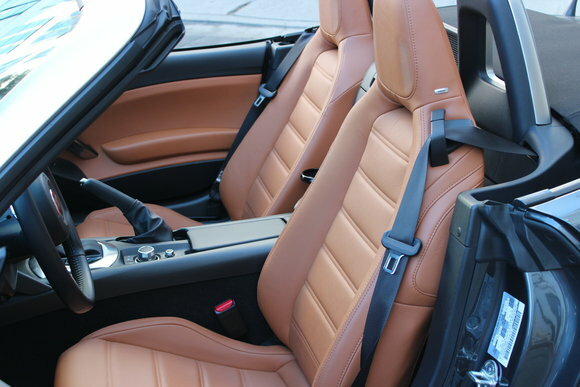 The two cars also use the exact same droptop mechanism: A single latch over the rear-view mirror releases the top, and easy, one-handed effort returns it to place. This might be the one newfangled feature I covet most. The NB Miata’s droptop can require so much effort, I often stay cloistered. 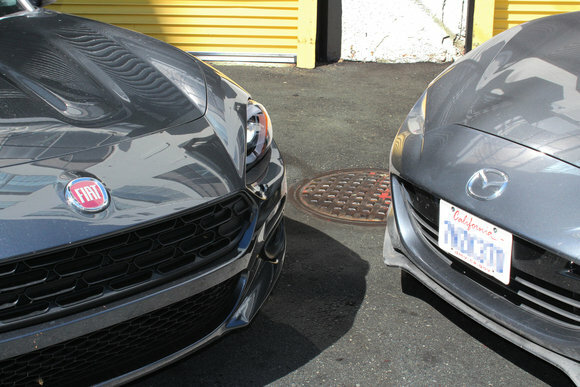 After driving both, I can speak to their respective “feels.” Let’s face it, the Miata is so frickin’ beloved—to the point of inspiring Fiat’s high-profile homage—for the simple fact that it’s fun to drive. My Miata is certainly that, and the 2016 Mazda MX-5 is just as pleasing. 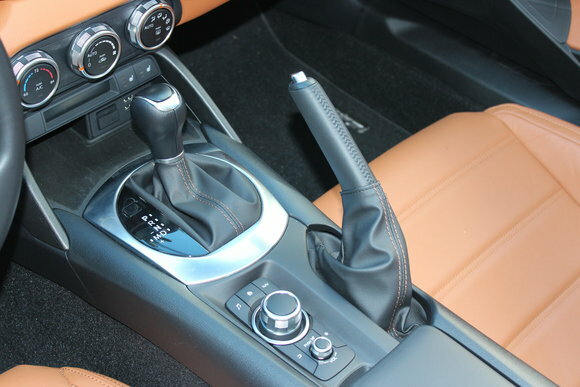 Both the 2017 Fiat 124 Spider Lusso and the 2016 Mazda MX-5 Miata we drove had the same 6-speed “manumatic” transmission. The comparison was somewhat inexact, as my 1999 Miata has a manual transmission, and the 2016 MX-5 Miata we had for testing was automatic. But using the newer Miata’s manual option at least let me shift gears at will, if not actually work a clutch, which made for a decent approximation. Sure enough, today’s Miata displays the zippiness, great handling, and satisfying pickup when you step on the gas that I associate with the Miata experience. 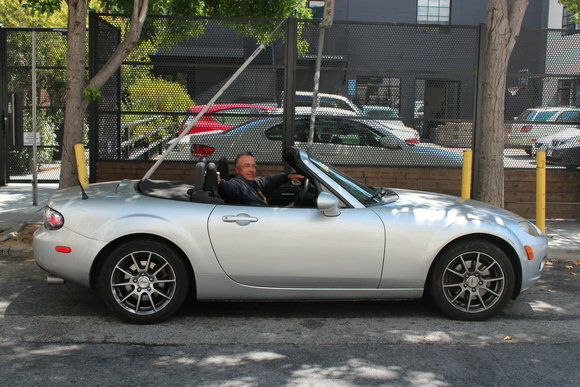 It felt like driving my Miata, but wrapped in a cushion of refinements—smoother, more insulated, a little less scrappy. 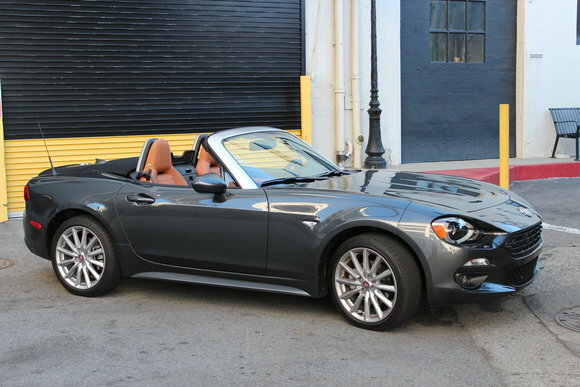 The 2017 Fiat 124 Spider, for its part, was very similar. Also a manumatic, it delivered the Miata’s signature pep and agility on everything from freeways to winding two-lane backroads to the beat-up streets of San Francisco. Interestingly, the Fiat felt even closer to the experience of driving my NB. It seemed like I could feel the road more, hear more of the engine. 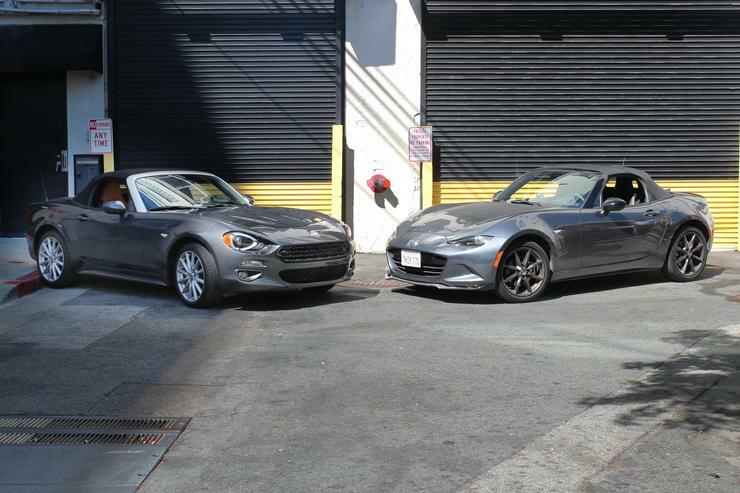 Nevertheless, the differences between the 2016 Miata MX-5 Miata and the 2017 Fiat 124 Spider are negligible. As a longtime Miata fan, I’d happily trade my NB (sorry, old friend) for either car. Jon: My passion, my commitment, my…oh, shiny! Jon L. Jacobi bought a used NA Miata in 2001 and hasn’t looked back. I’m a Miata guy. It didn’t come easy. The air-headed Lightning McQueen groupies in the movie Cars were Miatas. Enough said. But in 2001, I was looking for an affordable convertible. My choice was clear: I bought a used ’93 NA Miata with an aftermarket four-point roll bar and a hardtop. Did I know that I would wind up with one of the greatest production sports cars ever made? No. Pure chance. The 2016 Mazda MX-5 Miata has an aggressive new front design. I could try to create a sense of suspense over the next few paragraphs, but to heck with it: I liked the 2017 Fiat 124 Spider a lot. I liked the 2016 MX-5 Miata better. The Miata’s somber dark-charcoal paint, black sport wheels, and all-black interior couldn’t alter the fact that it was simply more fun. I say that even though the car has a front grille that looks like a maniacal, near-sighted guppy, and the horn emits an embarrassingly wimpy meep. The Mazda design team is either seriously conflicted, or having a laugh. The 2017 Fiat 124 Spider, on the other hand, comes off like the worldly sophisticate in both styling and road feel. It has a Roman nose (like my own) in the form of five additional inches of hood, and the interior—no one does interiors like the Italians. The 124 Spider’s is a dark camel, with an aura of warmth and class. My only design complaint was an interior door handle that dug into my left knee. Still, if I were trying to impress someone, I’d rather arrive in the 124 Spider than the MX-5 Miata. The 2017 Fiat 124 Spider has a distinctly different exterior design compared to the the 2016 Mazda MX-5 Miata on which it’s based. The other thing I loved about the 2017 Fiat 124 Spider was its power plant. The 1.4L four-banger surprised me torque-wise, and the turbo had just the right amount of lag before it punched in. The 2016 Mazda MX-5 Miata’s naturally aspirated 2.0L is smoother and winds nicely, but the tromp-on-it experience is nowhere near as thrilling. Beyond the turbo, especially when I hit the curves, the MX-5 Miata was the party animal. I wasn’t privy to the technical details of either suspension or steering mechanism, so I’m forced simply to describe the sensations. The cars felt far more alike than different. The 2017 Fiat 124 Spider was steady, but just slightly ponderous, and a bit floaty at high speeds (ahem) compared to the 2016 Mazda MX-5 Miata. I also didn’t like having so much nose in front of me. Fiat partnered with Mazda to revive its 124 badge with Miata underpinnings. The 2016 Mazda MX-5 Miata, with the exception of more body roll than I feel comfortable with (I installed an after-market Ohlin road/track suspension on my ride), felt like it went exactly where I pointed it. I drive a Miata every day, so it’s what I’m used to, and I’m sure I could acclimate to the 124 Spider in very little time. 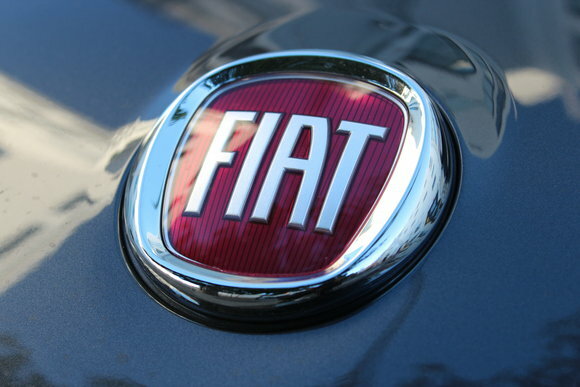 But it does tell you where Fiat went with its version of the Miata. Me? I’ll take the fun one. I like the Miata’s cleaner exterior styling better, though my colleague Katherine Stevenson felt the opposite. 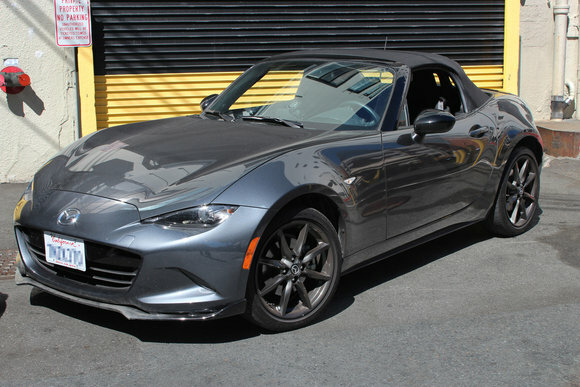 What I would really like is the 2016 Mazda MX-5 Miata’s body and suspension tuning with the 2017 Fiat 124 Spider’s interior, power plant, and horn. A hide-away display (its upper-dash position bugs me), and a rear windscreen that lowers would be nice. I’d also opt for Mazda’s manual transmission, which I hear is much like the original (both of our cars had six-speed automatics). Give me a Fiata like that and wave goodbye. I won’t be coming back.